All too often, people want to invest their hard earned money to create passive wealth, but either don’t understand how, where or what will bring the highest return on their investment. Passive income is what creates true financial freedom. It’s what allows you to be there to coach your son’s little league team, take an impromptu trip to Europe with the family or simply escape to your favorite fishing hole early on a Friday. Through this method, you can be living life on your terms while simultaneously collecting a reliable income through automated systems in place to protect your investment and compound your wealth. Historically, investors looking for passive income would go to their financial institution, give them the little money they could save from their 9 to 5 and slowly build up their portfolio through compounding interest and lots of patience. The numbers don’t lie, equities have provided an average return of roughly 8 percent historically, which most people would take in a heartbeat. That being said, stock market investors are at the will of economic disruptions, immense time requirements, greedy fund managers, duplicitous fees and a host of other issues out of the investor’s control. A common joke gaining traction among financiers is that now you can get return free risks rather than risk free returns. Over the past month, we have witnessed firsthand the volatility that comes with equity investing. 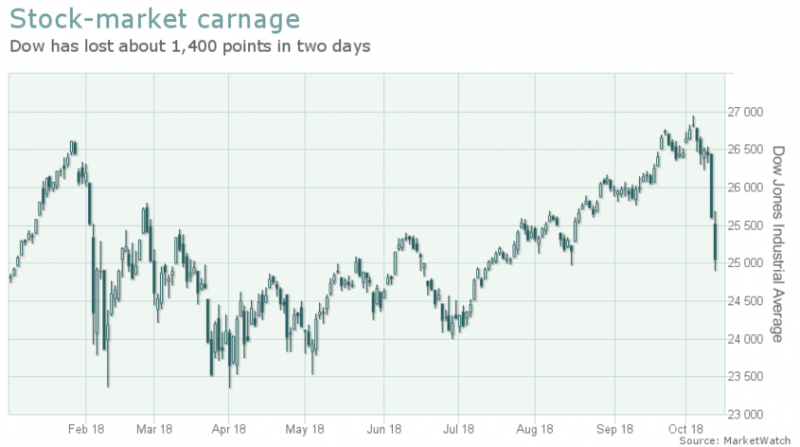 The Dow dropped a staggering 1,600 points since the beginning of October and continues to slide further into bear market territory, marking the worst month for U.S. stocks since 2011. 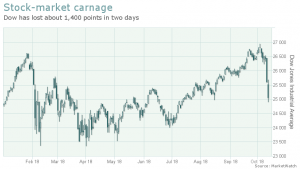 Unfortunately for uneasy investors, experts do not anticipate this trend to immediately correct itself due to a variety of issues such as increasing interest rates, fear of trade wars and disappointing quarterly earnings from the tech industry. If not through the stock market, how else can we achieve passive income and financial freedom? Passive income through real estate has dramatically increased since the market crash a little over 10 years ago and is acquired primarily through rental income and private money lending. Private lending is purely passive and typically deals with lending your funds to a business or investor without the need for a financial intermediary in exchange for a set return over a predetermined amount of time. Through this method, you have total control over rate of return, duration, investor selection and approval of the asset or assets your cash is secured by. Passive rental income is only achieved through having a well thought out business plan paired with a team of reliable professionals to facilitate repairs, verify accounting information and formulate a marketing strategy. This will cost time and/or money on the front-end, but through experience and automation this process will be streamlined to truly create a passive investment at the highest level. So, if real estate requires a bit more effort to truly become passive, why would you choose property over stocks and bonds? Rental properties give you total control of the investment you buy, the rent you charge, the improvements you make and the tenants you select. This degree of control is what draws so many people to this method of entrepreneurship, but can lead to complete disaster if you’re not prepared for the task at hand. This is juxtaposed with the stock market, where investors are at the mercy of many uncontrollable factors. Another reason for real estate being more advantageous is the benefit leverage can create for your growth. With the right lender, a $25,000 investment can be leveraged to purchase a property worth over $100,000. Once purchased, renovated and leased, you’ll have the ability to refinance for a higher loan amount. This gives you the freedom and capital to go out and find another deal to continue the process of buy, rehab, rent, refinance and repeat. If you’re experiencing a bull market as we have for the past several years, this strategy can fully maximize your cash on cash return and jumpstart your path to financial freedom. The government views real estate as a job making profession. In turn, it gives significant tax advantages to those willing to take on the risk. If you purchase $20,000 in stocks that grow to $50,000, you will be forced to pay high taxes on that amount when liquidated. Real Estate is full of tax deferment opportunities such as deductions, 1031 exchanges and depreciation. This could result in a difference of retiring at 45 compared to retiring at 65. Similar to real estate, equity investing is all about timing and situational analysis. If you’re happy with fluctuating, mid-level returns and little hands on control, equities might be a good route. In the long term, both are good options and have historically outperformed national GDP growth; however, if you’re an entrepreneur looking to get the most out of each dollar, real estate investing creates an avenue to not only create wealth, but also sustain it for generations to come while doing something you enjoy. The biggest risk you can take is to do nothing at all! Our goal is to institute a business which offers a wide variety of real estate services including commercial brokerage, land development and investment opportunities in the North Florida and South Georgia market areas. We hold real estate licenses in multiple states including Florida, Georgia and Alabama. Copyright 2018 TLG Real Estate Services. All Rights Reserved. Designed by Capital Data Studio.